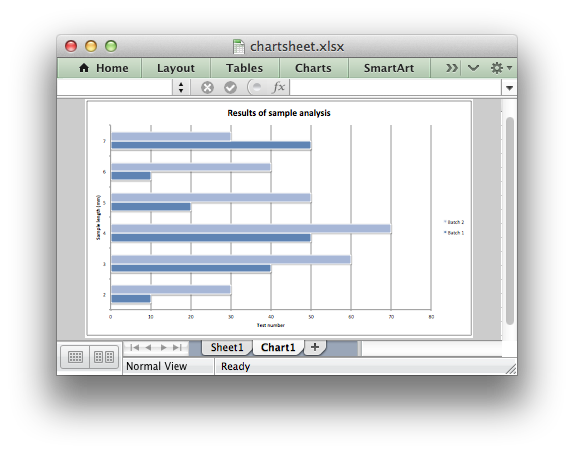 In Excel a chartsheet is a worksheet that only contains a chart. The Chartsheet class has some of the functionality of data Worksheets such as tab selection, headers, footers, margins and print properties but its primary purpose is to display a single chart. This makes it different from ordinary data worksheets which can have one or more embedded charts. worksheet  = workbook.add_worksheet()  # Required for the chart data. The data for the chartsheet chart must be contained on a separate worksheet. That is why it is always created in conjunction with at least one data worksheet, as shown above. Add a chart to a chartsheet. chart – A chart object. Only one chart can be added to an individual chartsheet. See The Chart Class, Working with Charts and Chart Examples. The set_zoom() method can be used to modify the displayed size of the chart.